In a previous post, “Use a Standards file to bring an AutoCAD drawing into line,” I explained how to check a drawing for certain standards, such as layers. This process is important for maintaining drawing standards where you work. From the Windows task bar, choose Start>All Programs>Autodesk>AutoCAD 20xx – English>Batch Standards Checker. In Windows 8, move the cursor to the upper or lower-right corner to display the charms and choose the Search charm. With Apps selected, type Batch Standards Checker and select it when it appears at the left. The Batch Standards Checker window opens, as you see here. On the Drawings tab, click the Plus (+) button and select the drawings that you want to include. Click Open. You can repeat this process to add drawings from a different location. To check xrefs attached to these drawings, check Check External References of Listed Drawings. 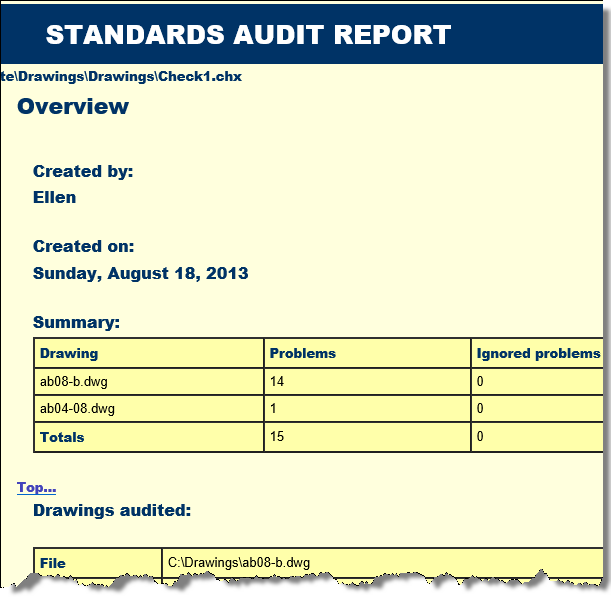 On the Standards tab, choose to check each drawing against its associated standards file if you have associated standards files for all of the listed drawings. Otherwise, choose to check the drawings against a standards file or files that you select. To select a standards file, click the + button, choose a standards file (.dws), and click Open. On the Plug-ins tab, choose the standards that you want to check. You can check dimension styles, layers, linetypes, and text styles. If you want, you can use the Notes tab to add notes that will appear in the report. Click Save on the Batch Standards Checker toolbar. 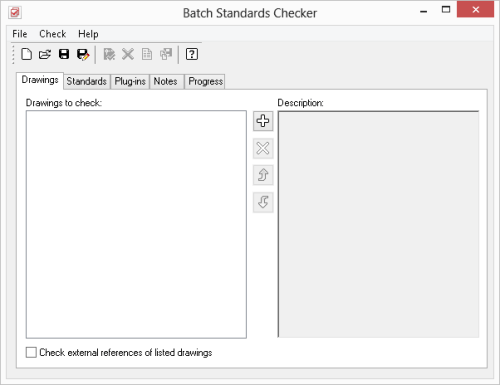 In the Batch Standards Checker – File Save Dialog box, save the standards check file (.chx), which contains information about the drawings and standards files you used for the batch standards check. To start checking the drawings, click Start Check on the Batch Standards Checker toolbar or press Alt+T. The checking process start. You can click the Progress tab to see what is happening. When the process is done, a Standards Audit Report is displayed in your browser. Mine opened in Internet Explorer, even though that isn’t my default browser. Do you use the Batch Standards Checker? What is your experience with it? Do you have any tips for using it? Hi,I am comala here . i need a help! how do i download batch standard checker in my computer to checking a drawing.